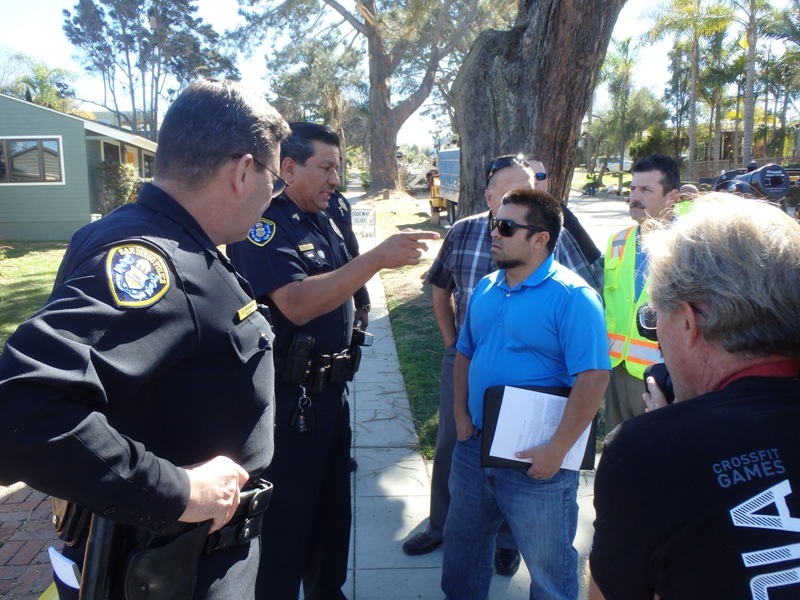 It was not a tense stand-off yesterday at the cutting of Torrey Pines on the 4600 block of Saratoga Avenue , but for several hours it was a stand-off – as a local OB man physically blocked the work crew. Geoff Page wasn’t going to budge until the city or Atlas produced the work and traffic control permits. 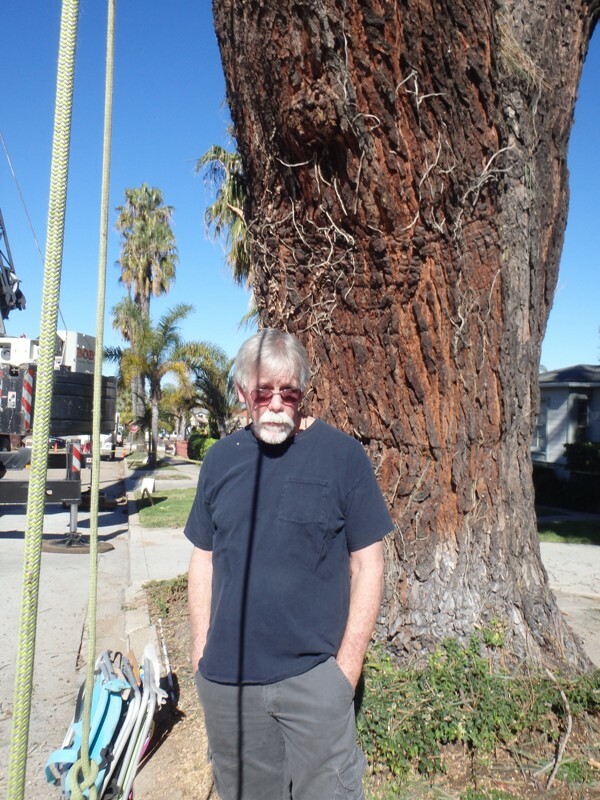 Geoff Page, a local resident and contractor, stood in the way of work crews from Atlas Tree Service, until, he insisted, they or the City produced permits for what they were doing. And he wasn’t going to budge until they did. The scene on the 4600 block of Saratoga. 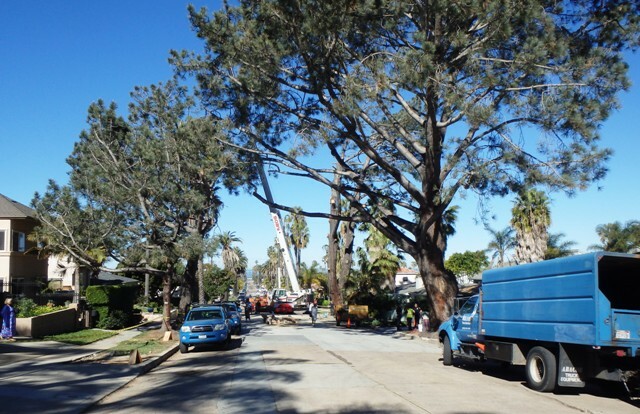 As soon as he took his position, work on cutting down the two Torrey Pines targeted by the City completely halted, and both the tree service crews and the crane service crews took a several-hour break. Work crews take break as Page forces compliance with procedures. Both Geoff and Atlas called the police. Four to 5 officers did show up. They explained that they were there to “control the peace”. This is the second Torrey Pine targeted for execution. This Torrey is one of the largest in North America. About twenty residents appeared or came out to the scene over the course of a couple hours – some to come to Page’s support, others to mingle and talk to the media or other neighbors. After hours of the stand-off, city arborist and his boss finally appeared.The arborist would not divulge his name, even to the media. But finally, the City arborist showed up with his boss and produced a cutting permit. Page also insisted that the City produce the traffic control permit for closing off the entire block of 4600 Saratoga. After another wait, it arrived on the street. Arborist questioned by police, media and residents. Both permits are supposed to be at the site where the work in occurring. In addition, the arborist is also supposed to be on site. Neither the permits nor the arborist were present until the situation escalated with Page’s refusal to budge from in front of one of the trees. Wide shot of some of the Torrey Pines. Several residents complained that the Ocean Beach Planning Board was not consulted. Atlas representatives and the city were asked to reconsider their actions and go through the process. 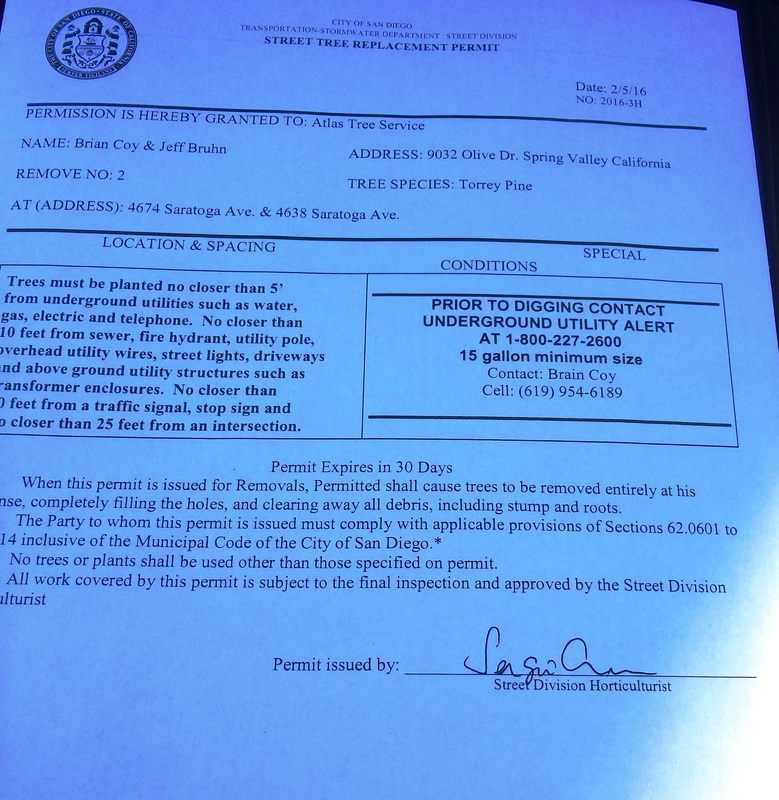 Street tree replacement permit produced by the city. The city cited “imminent threat” from these two Torrey Pines and claimed they didn’t need to follow normal procedure. 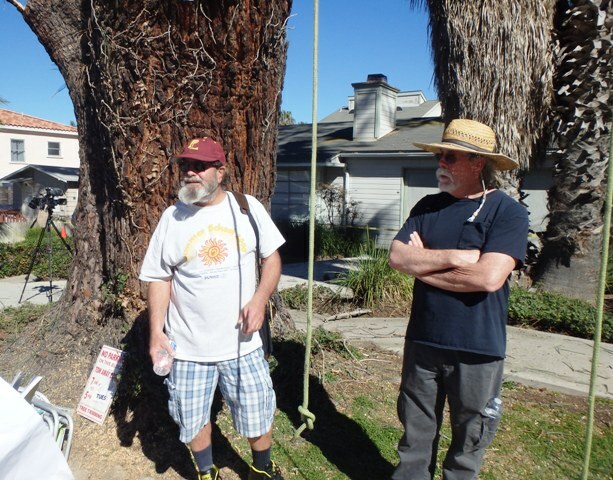 Rick Callejon and Geoff Page – both sounded the alarm to alert OB about the trees coming down. Finally, the few OBceans who had joined Page – and Page himself – melted away as the buss saws continued their deadly work. Atlas stated that the two Torreys would be down at the end of the week. The Torrey Pines on this block are over 80 years old – and tower 75 feet up. Torrey Pines are a protected species. Residents were upset with not only the process that the City did not take in cutting them down, but that the city didn’t appear to look into any alternatives other than death. Also, the arborist did not share with the community the exact reasons the city determined these particular two trees had to come down. Geoff Page was certainly the Man of the Hour yesterday as he forced the city to follow procedure and produce the necessary permits. Wow. Geoff, you are a stud. Period. Thanks, Frank. I wasn’t looking for any notoriety, it just seemed that I had no other choice at the time. I just wish we had been successful. the cultivation of a garden, orchard, or nursery; the cultivation of flowers, fruits, vegetables, or ornamental plants. 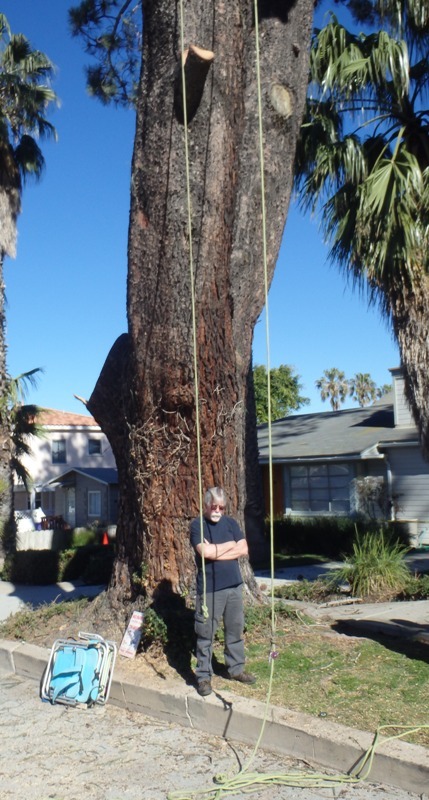 So why is a gardener making the decision to kill two magnificent trees? I intend to find out. Activists….got to be proud of them! The required closed street signs were in place today. Way to go Geoff!!! Thanks for standing up! STOP Killing our beautiful TREES! They must be saved: unless the City can prove they will fall! I was so sad I had to leave before the buzz saws started up again. Tip o’hat to Deb Greene for being first to alert the OB Rag. 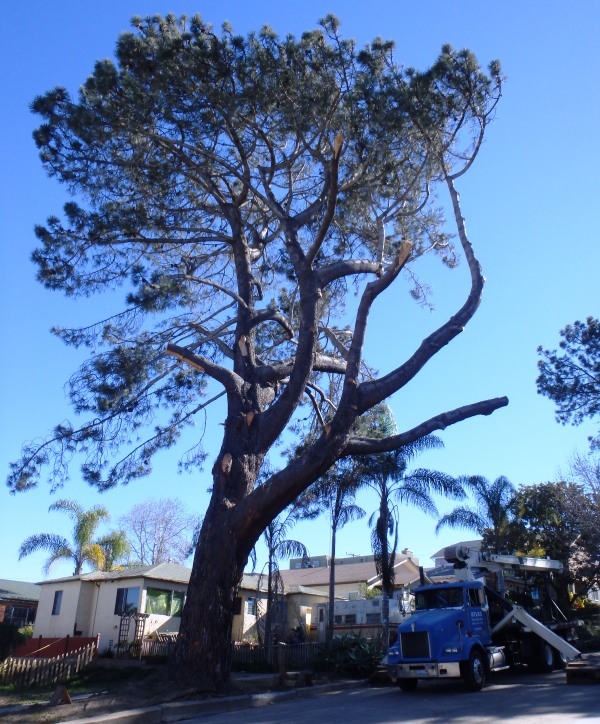 Oh, if OB had 100 Geoffs – we wouldn’t have lost these 2 gigantic endangered Torrey Pines. Not all local residents on that block wanted to see the trees destroyed. Where is OB going? No one squawks when 80 year protected species are cut down except a handful of old hippies? Really OB? Thank you for the mind comments OB Joe, but I don’t think anyone wants to see 100 of me, just ask my family! Don’t get too cynical, ol friend. 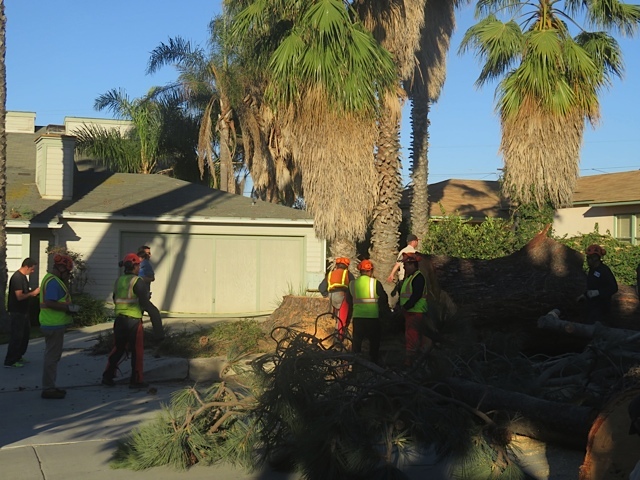 Perhaps the young people of Ocean Beach had other things to do; perhaps they don’t really care about these trees; maybe they care but were busy working, going to school, surviving their hangover. Listen, it takes a lot to get out there and actually get involved, and save aspects of the community that deserve saving. I agree with Molly, it was a Tuesday morning and young people have jobs and other obligations. There were some out there. I’m just fortunate in that I am more flexible in my work hours than some others and some of the old hippies are retired and also have the time. I also wanted to say thank god for those old hippies, like Jeoff. I don’t know if Geoff (not Jeoff) would identify himself as an “old hippie”. I did come of age during that time but I was never a real hippie. The hippies were like the extreme left then, I leaned to the left but not that far. But, it surely doesn’t offend me to be called one. When I stood there watching this go dawn, as the tree went down, I didn’t look at the locals who care about our community as hippies… instead I saw long to community members who have for decades dedicated their lives for decades to our community. They were former OB and PL planing board members, local business owners and a lawyer, writers, historians, community advocate/activists with degrees. These are the fabric of the kinds of people that have historically been the caretakers of O.B. It is always sad when the City fastbacks process and doesn’t involve the community. Some of us are historians and writers… and times like these will be documented and remembered. I wrote about the history of the Saratoga Torrey Pines in the Ocean Beach book by Arcadia two years ago. I just hope there will still be some of these pines left by the next book! Well said, Kathy. Thank you. Thanks to all who came to the defense of the those beautiful trees… I’ve probably walked, biked or driven by those trees thousands of times, they will be missed.. wake up OB… before it’s all gone. No concern for humans, eh? No concern for kids who might get squished when the tree falls? A clear example is what happened in PB two weeks ago. And what about the people who live under the umbrellas of these trees? Why weren’t they preventing the tree trimmers from cutting down the trees? Last September after hearing all the El Niño predictions I paid a tree service $2200 to trim the trees at my house on Brighton so they wouldn’t fall on my house. I do it every five years on average. I’d suggest everyone direct they’re energy to encourage the proper and healthy maintenance of exiting street trees in OB so we can prevent this sort of radical solution in the future. Those trees on Saratoga had grown into grotesque and dangerous shapes because of lack of maintenance. Start now with OB Planing Bd, then Zaph’s office. Get active if you love our trees. And please, don’t plant inappropriate trees in inappropriate locations! Check out the city’s street tree guide first. There are many situations where kids might not be so safe yet they are allowed to proceed…if they surf they could drown, play football and get permanent head injuries or bike and get run over a by vehicle. There are all types of exposures that can cause harm. Yes, a tree limb could fall should they not be allowed to hike in the woods? 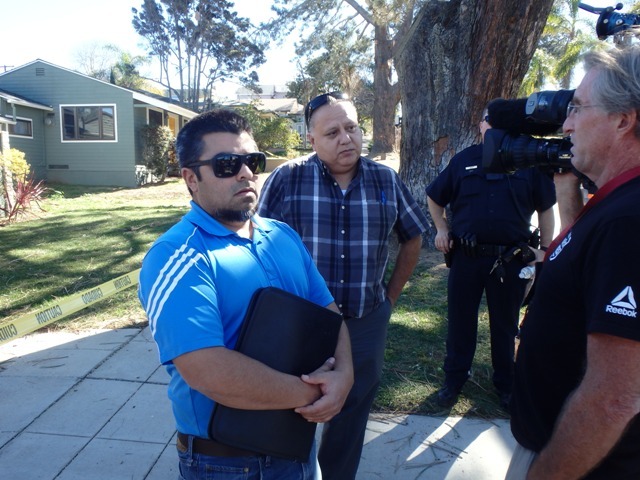 I believe everyone has concerns for kids and residents and property on the street. A big issue is the city is not proactive in taking care our the trees to prevent many avoidable issues. I can’t speak for the efforts or lack of efforts by the city on the Saratoga trees. In general, trees need to be trimmed. Tax dollars pay for city services so this type of maintenance should be adequately budgeted. 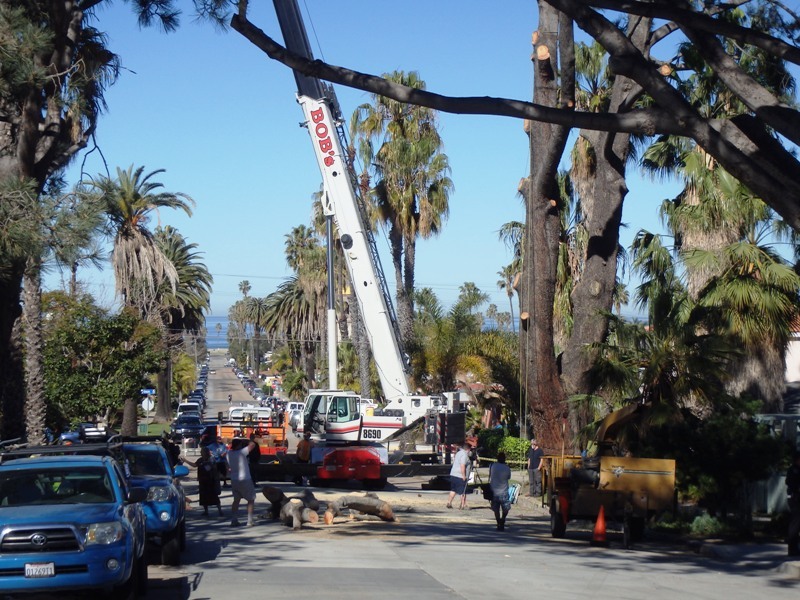 How about a plan for trees in OB…what ones may need to go because they are too large to be considered safe and what will be put in their place. Must they all be destroyed at the same time? They were beautiful! No one can argue again that point. Sure there is concern for humans, I never said I didn’t care about people. But, the City said the same thing about the tree on Long Branch we all saved and it is still standing strong. A culture of fear has invaded this country, probably started by Reagan but taken to dizzying heights by George Bush. The City provided no evidence that these trees were dangerous but they played on the fear factor. If you are going to let fear overcome you, you might as well stay inside a safe room for your whole life. When I say “you” I am referring to the world not just this poster. I want to thank everyone for the generous comments about what I did. As I said earlier, I was not looking for anything other than to save the trees long enough for there to be a discussion and a real investigation of the health of the trees. If you are fortunate to live long enough as I have, you will one day be faced with a moment when you have to decide whether to act or stand by. 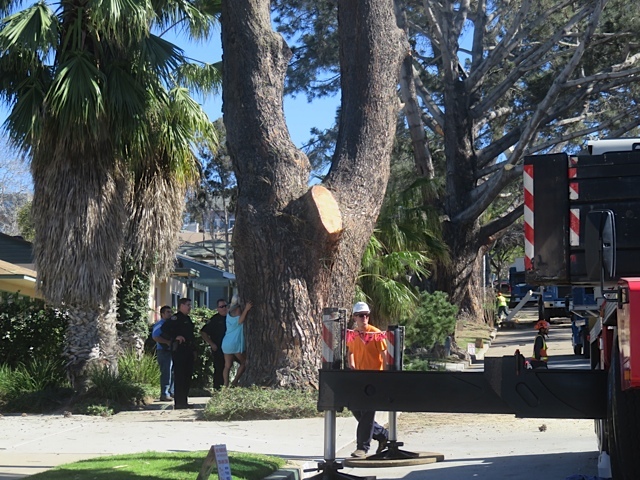 I was on hold to the SDPD dispatch line for 20 minutes watching as they butchered the westernmost tree. I saw that it would be dead before I could even get through so I realized this was my moment. It wasn’t particularly heroic, I have been in the construction business my whole career. Because of my experience, I knew that if I stood under the tree, they would have no choice but to stop because protection of the public is the number one priority of companies like Atlas. Anyone can do this and all they can do is call the police. But, thank you all for the comments. Well done, Geoff! Upward and onward, Kathy. Hidden decisions, made behind closed doors. Outrageous. So easy to destroy; so difficult to create. As someone who had a giant city-owned tree fall on my house during that recent storm, in a different part of OB, and amazingly me and my family come away safe, I have a newfound understanding of the ‘fear’ that a a resident might have. That said, I also am a lover of trees and am having to straddle the fence on this issue. I have gotten lucky this time, and may not be so lucky the next time if I, or the city, is not proactive. It would be something I would question for the rest of my life if I pushed my luck. But again, I love the big trees that line my street and it is what drew me to want to live here. My wife and I were so sad the one fell. Quite the delimna. My solution is the ‘city arborist’ (a real one) come out on their dime, and assess all the other trees and their health. And be proactive about trimming, it is the absolute most controllable solution. Cost to the city of being pro-active vs. cost to the city of being reactive. I would think a lawsuit would coast more after the fact of negligence to maintain city trees. Now there is a reasonable appropriate comment. I’m sorry to hear about the tree that fell on your home and happy no one was injured. Your suggestion about proper care of the trees is exactly what I was trying to get the city to consider. The Torreys just needed trimming. They had the crews and the cranes needed to do it that day but refused to consider the suggestion. The city refuses to live up to its responsibilities, the trees only came down because the city did not want to spend the money to care for them. They survived some of the strongest winds I have ever witnessed in 40 years of living in San Diego, that alone was proof they were viable. Trimming the canopy would have reduced any worries about the future. It was completely unnecessary. Good for you Geoff , & thank you for the effort. – you tried. Frankly, I don’t understand California’s attitude & treatment of trees. I’ve lived in about 11 0r 12 states & though I’ve been here a long time, I still don’t get it. Eighty years old, huh – the little town I come from (one of the poorest in the US) has trees well over 200 years old. Here, if a tree manages to attain 9 or 10 feet of height, they either cut it down or behead it; then they wonder why the have smog. PS: I’m particularly fond of old hippies, being somewhat of one myself. Well, thank you for that, sloanranger. I still can’t drive down that street because I have to admit failure when I do and I miss those trees. I’ve lived in OB for 37 years of those trees’ lives and they were beautiful. I used to drive down that street on purpose just because of all those trees. I’m not sure about the rest of California but San Diego surely has a bad attitude about trees because they either don’t want to spend money on them or they are worried about liabilities. We just have to be diligent.